The Blog Formerly Known As The Blue Cottage: Cold Remedy: Make Art! 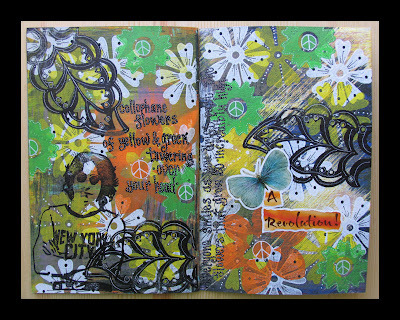 *the junk mail used in this piece are the butterfly and the words 'A Revolution' (it actually said "A Mexican Revolution" an advertisement for a local Mexican restaurant!). When Kelly and I were emailing last night I mentioned to her that I made art - but not dinner! You have really great ideas. Flassie...thank you! I am happy to see that you've visited again! Jolene, you know how much I love The Beatles and now that the song is in my head........! Great spread and I love the dottie thing you have going on. They really make the letters look trippy! What kind of white pen are you using? I am so in love with your junk mail art and art journals. Hope you are feeling better! Linda..yeah, I KNOW you love the Beatles as much as I do :) My little dotties on my hand lettered text is done with the Sakura gel pens :) I've always been obsessed with making dots..LOL! Hope you keep feeling better while making Art, not dinner! Yay elizabeth! :) Good for you! Thanks for visiting! 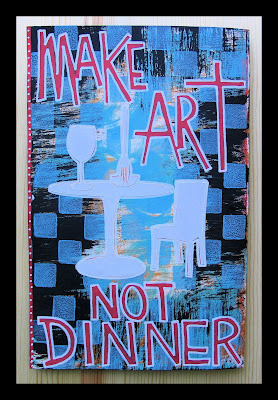 Make art not dinner, that's a great mantra! My art is way better than my dinner, but if you saw what I just cooked, you'll know that its not that hard! hehe! As always, another masterpiece from the master-visual journalist! Jolene!! These are SOCOOL! I love your new mantra - I'll have to use that with Mike "I'm making art, not dinner!" (not that he expects me to cook, thankfully!) I have been SO not making art lately. I have to get back to it. Your pages are really great and inspire me. cre8tiva (Rebecca)...I hope YOU are feeling better! Always so nice to have you visit here. Take care! tammy - thanks! And Tammy...I hope the muse finds you and you begin creating again soon! We all go through our ups and downs of creativity, I know...for now it looks like your creative outlet is your photography...the flower photos on your blog ROCK! Yes, I am slightly obsessed with my camera at the moment. :) And my flowers are just bloomin' crazy too! So, For now, that's what I'm doing with my extra creative time... and I know that's OK too! I have some swaps coming up though that will force me to create art! And that's a good thing too! Good medicine, the kind that is easy to swallow and taste good. Isn't it true that creating makes us feel good! tica...so good to see you here (almost didn't recognize you ;-) Creating IS one of the best medicines indeed! It's such fun to see how you incorporate the "junk" into your art pieces. Lidy..it was great having another California girl show up in the Netherlands :) And thanks for the nice comments regarding my art! Such beautiful sights! Love your site! And the "Make art not Dinner"! YES! I definitely need to put one of those signs in my kitchen! jill...so nice to meet you! You share the name with my daughter ;-) Thanks for the compliments..right back at you regarding your blog as well!! !